Tedrick’s Roofing takes pride in being a roofer certified by GAF®, one of the most recognized names in the roofing industry. However, besides being a GAF Master Elite® roofer, we are also happy that we are given the chance to offer the Roofs for Troops program. As your trusted roofing contractor in Kent, we are honored to share with you what this program means and entails. GAF Roofs for Troops: What is It? GAF Roofs for Troops is a rebate program offered to members of the military, whether active, retired, or veteran. In this program, troops are entitled to a $250 rebate when they acquire a GAF Lifetime Roofing System through a GAF-certified roofing contractor. This program was developed to show the roofing manufacturer’s recognition of the hard work and heroism of our military personnel. GAF Lifetime Roofing System: What Makes It the Ultimate Choice? 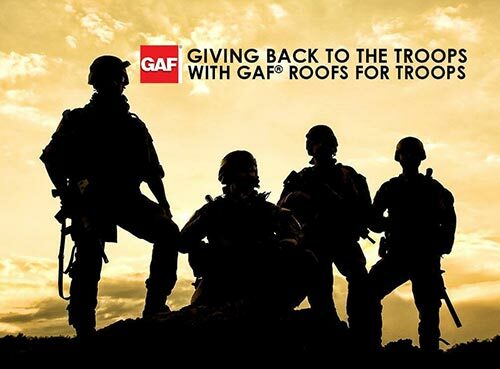 As mentioned above, the GAF Roofs for Troops is a rebate program for the GAF Lifetime Roofing System. This product consists of GAF’s Lifetime Shingles and at least three qualifying GAF roofing accessories. This could prove to be a more viable solution for those who are in need of extensive roof repair in Auburn, since it is a complete roofing package. In addition, the Lifetime Roofing System is covered by the GAF Shingle and Accessory Ltd. Warranty. When we say “lifetime,” it means that the roof will be covered by warranty as long as the original individual owner at the time of installation of the Lifetime Roofing System is still living in the home. If you are an active, retired, or veteran member of the military in need of quality roofing in Federal Way, WA, call us right now at (877) 212-9355. Rest assured that we will assist you throughout the rebate process.